A State Funeral Service will be held at the Broken Hill Entertainment Centre commencing at 11.00 am. The public is welcome at both the Funeral Service and interment at the Broken Hill Cemetery. Kevin Charles "Pro" Hart passed away 28 March, 2006 at his Broken Hill home, surrounded by his family. Aged 77 years. Pro Hart has a good claim to be the best-known and most popular artist in Australia. His works, closely observed depictions of the scrubby bush landscape and the small-town life of rural New South Wales, painted in a richly coloured if slightly naive style, have a wide and ready appeal. It was an appeal enhanced by Hart's generous, outgoing character and by the fact that he sold most of his work from his own gallery - the Pro Hart Family Gallery - in his native Broken Hill, New South Wales. His fame was only enhanced by his starring, between 1988 and 2003, in a series of television advertisements for a brand of easy-to-clean carpet. He received some local encouragement, along with the nickname "Professor", soon shortened to "Pro". Having begun painting full-time in 1958, Pro Hart had his first one-man exhibition in 1962 at the innovative Kim Bonython gallery in Adelaide. It was an immediate success. Despite a rapidly growing reputation across Australia, Hart preferred to spend his time and his energy at Broken Hill. He opened his own gallery there. 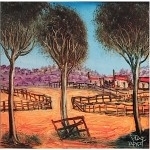 The town and the surrounding bush country remained the abiding theme of his art. And it was his proud boast that he had won the Broken Hill Art Prize on five occasions. He drew other artists of a similar outlook to the area, and helped to foster something of an Australian Outback Painting Movement. During the 1960s and 1970s he exhibited internationally - in London (where the Duke of Edinburgh acquired two of his works), France, Egypt and America. One of his pictures is in the White House collection, another was bought by Arnold Schwarzenegger. His exhibition in Tel Aviv in 1977 was the first show by an Australian artist in Israel. few images that he made not of the Australian scene was a series of large-scale paintings depicting the horrors of the Gallilpoli campaign. Hart was appointed MBE in 1976. It was only one of several accolades. He received an Australian Citizen of the Year award in 1983 and a Centenary Medal in 2003. Broken Hill town council honoured him by declaring 2004 the "Year of Pro Hart". His studio-gallery by then had become a major tourist attraction, the home not only of an impressive collection of Australian and European art but also of a huge Rodgers Electric Pipe Organ. Hart counted organ playing amongst his favourite pastimes, along with body-building, vintage cars and pistol shooting. He was a man of strong and sometimes colourful views. He had a great appetite for right-wing conspiracy theories. But this went hand in hand with his generous charity work and his strong Christian beliefs. He was a member of the Gideons, and often surprised acquaintances by presenting them with hand-decorated copies of the New Testament. Such was Hart's commercial success that, towards the end of his life, he became concerned about the growing market for forgeries of his work. To counter this danger he developed a method of tagging each of his pictures with a trace of his own DNA - taken with a swab from the inside of his cheek. He is survived by his wife, Raylee, and children John, Kym, Marie, Julie and David.